Hakeem Olajuwon was one of the most versatile big men in NBA history and a highly-productive player during his entire career. "The Dream" enjoyed a very successful run at center on both offense and defense, and Hakeem Olajuwon cards remain popular in his retirement. Born in Nigeria, Hakeem Olajuwon did not play basketball until he was 15, but he caught on quickly. By the end of his career, the towering Olajuwon was a 12-time All-Star and two-time NBA Champion and Finals MVP. He also was the 1994 regular season MVP. His signature "Dream Shake" best showcases the impressive athleticism that the seven-footer possessed. View a video of the top ten Hakeem Olajuwon NBA plays. In spite of this success, many Hakeem Olajuwon autographed cards can regularly be found under $50, including some of his premium options. 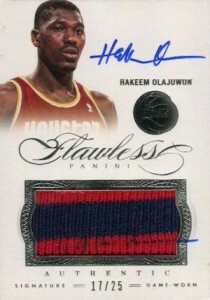 The following list includes the top ten Hakeem Olajuwon cards available today. 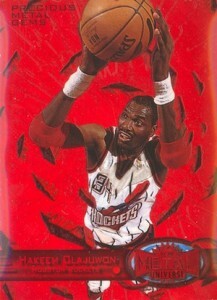 Are there any Hakeem Olajuwon cards that you think deserve a spot? Mention them in the comments. The cards are listed in chronological order. Click on the links and images to shop for singles on eBay. 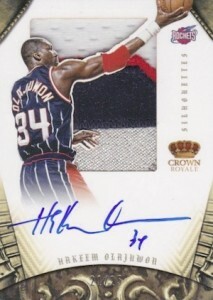 Although the Star Co. brand has long received mixed reviews from the collecting world because of the counterfeit and reprint issues and incredibly limited distribution, there is no discounting its significance as the first NBA-licensed card for multiple star players, including Hakeem Olajuwon. The vivid orange border is eye-catching, but the design is relatively simple. 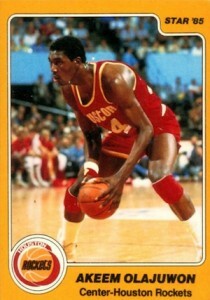 The 1984-85 Star Hakeem Olajuwon card is one of the toughest cards from the set to find in a high grade. 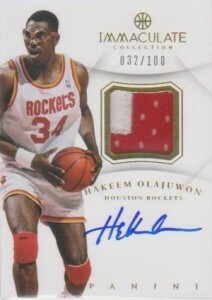 Additionally, collectors may notice a name discrepancy on early Hakeem Olajuwon cards. This 1984-85 release was the first of several cards that lists Olajuwon's name as Akeem, as opposed to the more-familiar Hakeem. 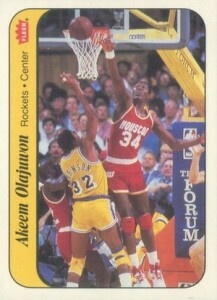 Olajuwon changed the spelling of his name from Akeem to Hakeem in 1991. Despite releasing two years after the Star Company card, many still view the 1986-87 Fleer card as the true Hakeem Olajuwon rookie card. The colorful border and glossy finish gives a high-quality design that was not common at the time. 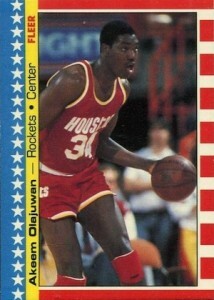 There is also a sticker insert for Olajuwon, which offers a completely different look. Raw and mid-grade versions for both cards can be found for less than $25. 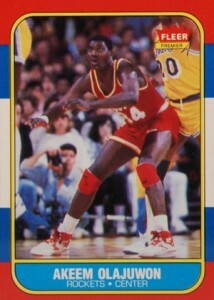 A largely underappreciated set, 1987-88 Fleer offers budget collectors an intriguing early Hakeem Olajuwon card. The overall appeal is hurt by the lack of star rookies and the unfortunate circumstance of following up one of the biggest products of all-time. Regardless, the relative rarity of the product has pushed unopened box prices quite high. The 1987-88 Fleer design is not as distinct as the previous year, but still offers a solid base card for Hakeem Olajuwon fans. The sticker insert returns, but the design does not work as well as the 1986-87 card. Fast-forward a few years and Akeem is now Hakeem. 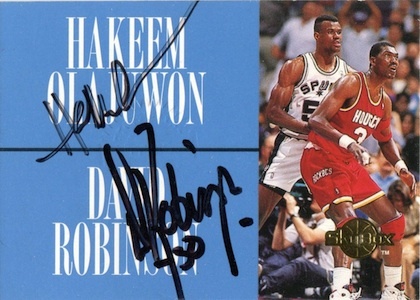 As one of the very first Hakeem Olajuwon autographed cards, the 1994-95 Skybox Premium card has the added benefit of a David Robinson signature. The card came via redemption and shows the two giants battling for position. The dual signed card does not surface often and that is directly attributed to the tough 1:15,000 pack odds. 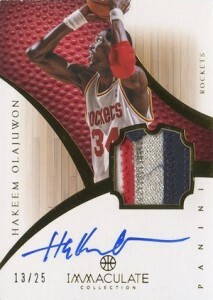 Another early autograph from Hakeem Olajuwon, Autographics is one of the most popular signed options from the 1990's. 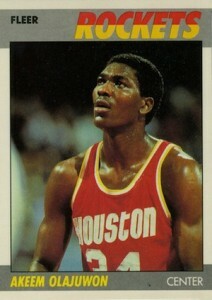 Although the blue signatures were intended to be included as a short print, all of Olajuwon's card were signed in blue. Like most top players from this period, Hakeem Olajuwon's Precious Metal Gems parallel from 1997-98 Metal Universe is a hobby favorite. As the first product to feature PMGs, they generally produce the highest values. 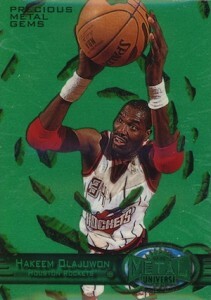 Although the foil Hakeem Olajuwon cards are numbered to 100, the first ten cards were the rare green version and the remaining 90 were red. The cards are very condition sensitive. Another first in basketball, 1997-98 Upper Deck Gamer Jerseys provided a concept that was monumental at the time. 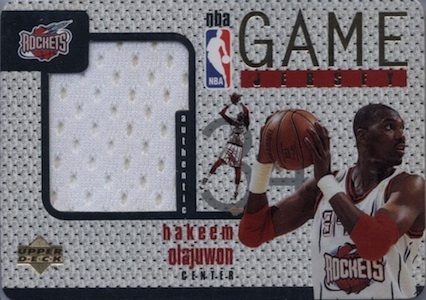 With a drop rate of 1:2,500 cards for the 22-card set, the Hakeem Olajuwon jersey card is not an easy pull. 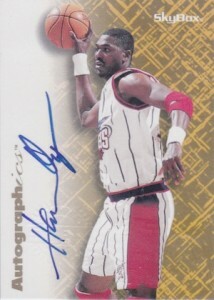 Absent from the inaugural Exquisite Collection product, Hakeem Olajuwon was featured on several autographed cards in 2004-05 Exquisite Collection. Limited Logos is one of the top options based on the large jersey patch, on-card signature, and more manageable print run. With a large jersey piece, on-card autograph and low print run, 2011-12 Panini Preferred Silhouettes combines three collector preferences with a modern design. Numbered to only 25, they don't appear often. Rounding out the list, two premium 2012-13 Panini products offer several great designs for Hakeem Olajuwon card collectors. Now that the original hype has settled, prices are more reasonable despite the low prints. Have several cards in mint to near mint condition for sale no offer refuse.